One of my favorite buildings in downtown is The Civic Center. It was one of my first memories of Asheville when I drove here for the first time over four years ago. It draws a strong defining line on the city’s northern edge created by a dramatic overhang mixing rustic stone and modern poured concrete and glass. The scale of the stone, cantilevers and the overhang impressively floats off of the hillside balancing the scale and anchored by the entrance positioned further uphill. 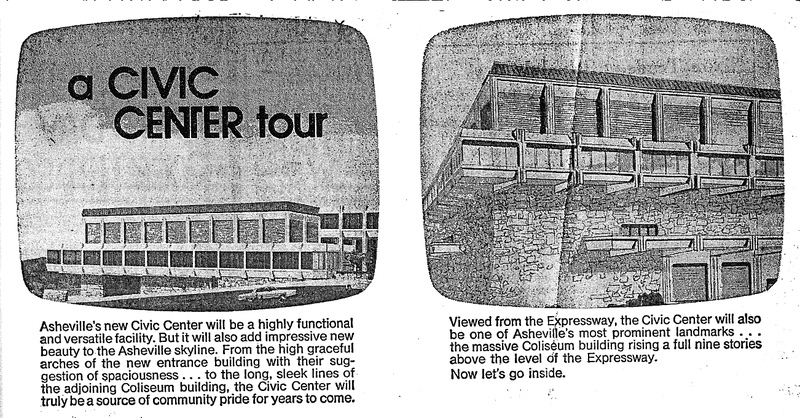 The Civic Center opened June 22, 1974 with Bob Hope performing. 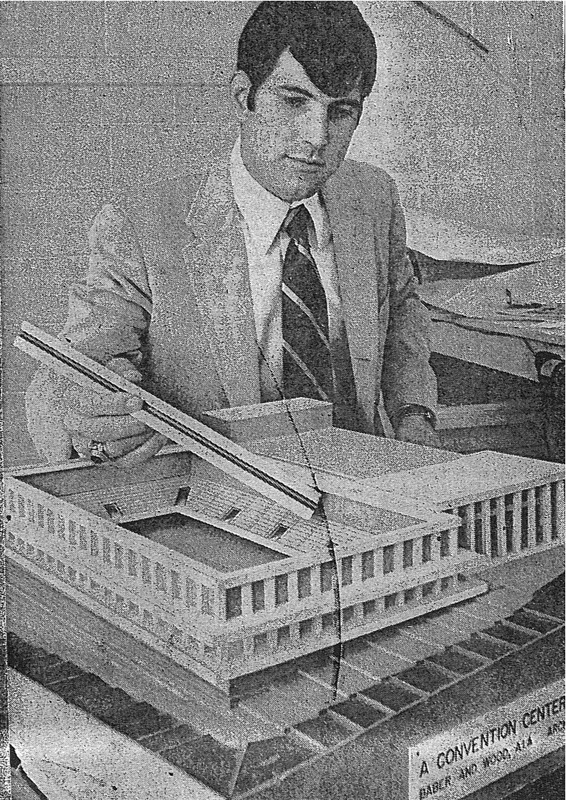 Architect John Cort drew up the Civic Center plans; he was of the firm Baber & Wood. An original committee called the “Best for Asheville Committee” organized the plans for the Civic Center and most of the building was paid for by a special bond voted on by the residents of Asheville. 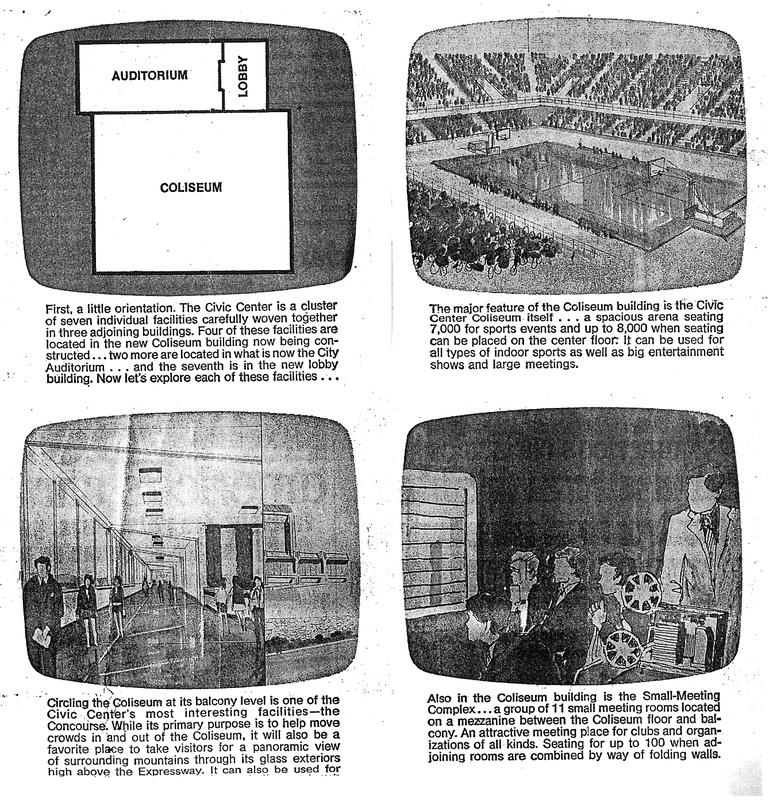 Below, these illustrated snapshots were published in the Asheville Citizen in 1971 and give a great description of what the Civic Center was to become. This past year the Civic Center went through some extensive renovations on the auditorium. I was glad to see that they preserved the original design of the exterior. I know given time more people will come to appreciate the 70’s landmark and its place within the urban fabric of downtown Asheville. Fifty years from now it won’t be only the deco style buildings that are admired, but the rich environment woven together from all decades of architecture represented in our downtown. A Commentary on the BB&T Building in downtown Asheville. Local Architect Mark Allison was generous enough to send me his new video commentary on the BB&T Building. Enjoy this interesting history into the architectural influences of Mies Van Der Rohe. Copy the link at the bottom of this post into your address bar. The BB&T Building was completed in 1965 as the headquarters for North Western Bank. It is 18 stories, was built by George Goodyear and designed by D. Gene Whittington. The BB&T building reflects the International style of Mies Van Der Rohe. Mies’s thirty years as an American architect reflect a more structural, pure approach towards achieving his goal of a new architecture for the 20th Century. He focused his efforts on the idea of enclosing open and adaptable spaces with clearly arranged structural frameworks, featuring pre-manufactured steel shapes infilled with large sheets of glass. His early projects at the IIT campus and for developer Herb Greenwald opened the eyes of Amercians to a style that seemed a natural progression of the almost forgotten 19th century Chicago School style. His architecture with origins in the German Bauhaus and western European International Style became an accepted mode of building for American cultural and educational institutions, developers, public agencies, and large corporations. The BB&T building does not live up to some key design principles of Mies as Mark will point out in his video. “Designing a new library is a lot like designing a new supermarket. You need to display the merchandise attractively, sensibly and easily accessible to the customer. 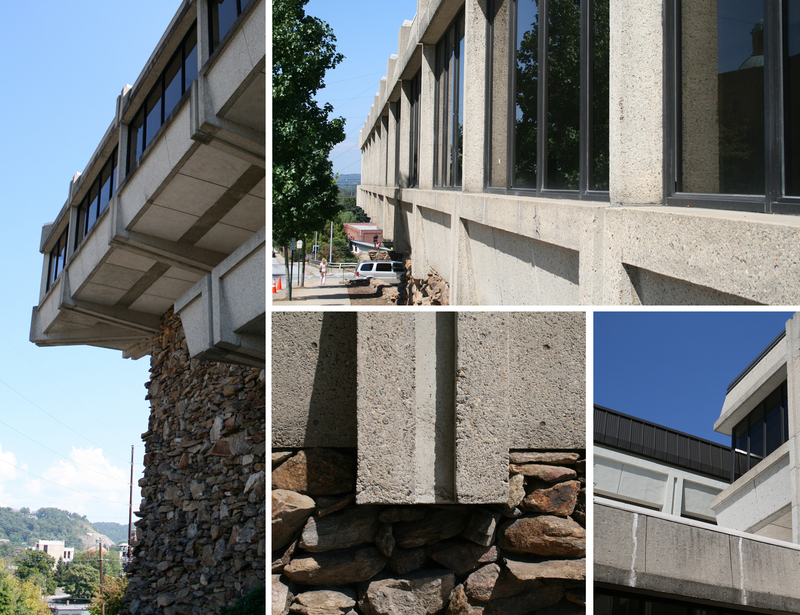 You also need to get enough light on the subject.” These were some of the comments by Asheville architect Bertram King when designing the Pack Memorial Library in the 1970’s. Planning for the new library started in 1966 when the library trustees put together a program for the new library. The opening took place on Nov. 20, 1978. The building cost approx. $1,741,000 to build and was paid for by Buncombe county voters approving a special bond. Reading some of the architect’s original comments on his design you can start to understand the construction. Along with ease of function, King, was considerate to use some basic green design elements. He took advantage of the sloping site to incorporate sunken courtyards that allow for natural light into the lower levels. The 1970’s decade produced many sealed buildings that focused on using air conditioning and the latest in mechanical systems. However, as King states, “We have reverted to an older, less expensive system with the new library building. It’s called opening the window”. Between the natural ventilation and insulated glass there was an effort made to lower energy use. When standing at the corner of the building one can appreciate how the building unfolds. It is like a stage set for browsing and reading books. The glass, angles and setbacks of this modern design allow you to see the function throughout and the relationship from inside to outside. The building has a simple elegance and is comfortable in proportion and scale. Ignoring some issues in urban context and function similar to many modern buildings of the era, the thoughtfulness behind King’s design as with many of his buildings comes through. See Bertram King on the right to find out more about his Asheville designs. Hotel Indigo is a new boutique hotel situated on the edge of downtown where the former Chamber of Commerce building sat. It can’t be missed towering over the highway 240 while currently under construction. Here is information provided by reporter Mark Barrett of the Citizen-Times: The building will contain 100 hotel rooms and 12 condominium units. Hotel Indigo is a relatively new brand of InterContinental Hotels Group, a United Kingdom based company. The chain is “very artsy and eclectic,” and Hotel Indigos are designed individually instead of employing chainwide, cookie cutter designs. This new hotel is designed by a local company. The nine-story building is located to the north of the Thomas Wolfe Memorial, between the eight-story Altamont Apartments and the 12-story Renaissance Hotel, on the site of an existing parking lot. All homes have views of downtown and the surrounding mountains. A 100-space underground parking garage is accessed from Woodfin. Eight walk-up gallery lofts, a ground-floor lobby and extensively landscaped sidewalks improve the entire area’s pedestrian appeal. Along Market Walk, the gallery lofts with private patios brings a neighborhood feel back to the neighboring Wolfe Home. Street-level commercial space along Market and Woodfin Streets adds vibrancy to the area, with space for 10,000 square feet of retail shops and offices. The recent remodel of 82 Patton Ave, is a great example of updating a mid-century modern office building to fit today’s modern style of downtown. According to Tessier Associates, the Capital Centerk, designed by John Rogers of Rogers Chenevert Architects, and redeveloped by contractor, Beverly Grant, — has been transformed from a dark brown remnant of the past to an inspiring focal point overlooking Asheville’s Pritchard Park. Terraces have been added to the façade facing Patton Avenue, providing each of the upper floors with outdoor space. The interior of each floor now boasts floor to ceiling glass windows, which provide bright and airy work space. Common area finishes for the building have been selected and the first tenants plan to move into the building mid-September. This modern, downtown mixed-use building was created as a quality, low-maintenance structure that respects Asheville’s historic architecture. 12 South Lexington, designed by Camille-Alberice Architects was completed in 2007 and recently added to the list of architecturally successful new buildings in downtown. Overlooking Pack Square and Patton Avenue, the 7-story building includes 2 commercial spaces, 43 residential condos and 49 parking spaces. Considered a smart growth project because the site was an underutilized parking lot and not a green space. The steel frame for the building was manufactured from over 200 recycled automobiles. The steel stud framing is also manufactured from recycled steel. The lower roof is sodded to absorb rainwater, provide insulation and protect the inner roof membrane. The wood floors are primarily of bamboo, a sustainable, harvested material. The thermal envelope of the building exceeds the building code requirement by approximately 14%. Aluminum, double-paned glass windows and doors, lower the energy costs for homeowners and HOA alike and can be opened to take advantage of Asheville’s fantastic weather and reduce the need for AC. Parking decks under the units reduces the footprint of the building.